Tyson Fury To Face Former Champ Ruslan Chagaev Next - A Good Test For Tyson? Tyson Fury To Face Former Champ Ruslan Chagaev Next – A Good Test For Tyson? 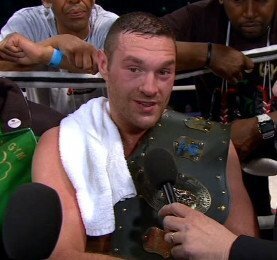 By James Slater: According to British Boxers.com, who were afforded an exclusive interview, unbeaten British heavyweight star Tyson Fury will next face experienced former WBA heavyweight champ Ruslan Chagaev. The fight is set for November (exact date and venue to be announced). 33-year-old Chagaev, 29-2-1(18) was once looked at as one of the very best heavyweights in the world. Known as “The White Tyson,” the southpaw had an excellent amateur career and his pro career went without a hitch until a 2009 corner retirement loss to world ruler Wladimir Klitschko (arguably Wladimir’s best-ever, most punch-perfect, performance) . Before that one-sided fight, that saw “Dr. Steel Hammer” sweep every minute of every round, Chagaev had, for just over two years, held the WBA crown. Wins over John Ruiz (a final eliminator) Nikolay Valuev, Matt Skelton and Carl David Drummond still look pretty good on the Uzbekistan’s record. Since his best days, Chagaev has had health problems (hepatitis) and he has also endured long layoffs. 4-1(1) since the loss to Klitschko, Chagaev’s other loss came on points to Alexander Povetkin in a failed attempt at regaining the then vacant WBA strap. So-so wins over Kerston Manswell (WU8) and, last time out, Billy Zumbrun (TKO 3) have seen Chagaev keep a little more active as of late. 24-year-old Fury, 19-0(14) is coming off a 5th-round TKO over the always-game Vinny Maddalone, and this next fight will be his biggest test yet; at least on paper. It would be a big win for Fury if he were able to smash Chagaev and legitimately KO him – becoming the first man to do so. But this may be asking too much of the former British champ. Chagaev still looks durable and he has that experience. The older man’s southpaw stance is unlikely to trouble Fury, who has shown he can box from the southpaw stance himself (see his win over Martin Rogan), but Chagaev might have a few other tricks up his sleeve for the still-learning giant. I think this fight has a good chance of going the distance (it will probably be scheduled for ten-rounds), and Fury may well learn more from this fight than from any previous bout. A win is the most important thing, but a KO win really would be impressive. I take Fury to box patiently and win a reasonably wide decision. You are here: Home / Boxing News / Tyson Fury To Face Former Champ Ruslan Chagaev Next – A Good Test For Tyson?